Users can create ad for store with the Buy It Now Category. Excellent lineup of items to buy this week! Selling consignments and estate items. Don't miss: several pieces of gold jewelry, silver and other jewelry, collectibles (vintage and newer), and home goods. Big selection! Gold and silver coins; modern and vintage coins; key date silver dollars; modern encapsulated coins. Lots of variety with something suitable for everyone - beginners to advanced collectors. Thank you for joining us! Pickup on Thursday, 2/28, 10:00 a.m. to 6:00 p.m. Preview: Wednesday, Feb. 13, 1:00 - 6:00 p.m. Bidding ends SUNDAY, Feb. 17. All coin orders can ship for $8.00 (max) regardless of quantity purchased. Preview in-person: Wednesday 1:00-6:00 p.m. Coin Auction. High end encapsulated coins. Collectible costume jewelry; gold and sterling silver jewelry; knives; estate and household items; and the second group of Annalee collector dolls. You'll find some great items this week. Thank you! Selling local estate items and more. Excellent Selection of coins this week with some high grade and most encapsulated. This is the start of a nice collection of coins. Something for everyone this week! Selling from an estate home with everything from furniture to antiques to jewelry, plus assorted consignments. We will also have a second session of COINS following this auction Wednesday night. Very high quality collectible coins. GOLD and SILVER. Also, check out the buy-it-now store for fixed price deals on some coins, while they last. 25+ pieces of gold estate jewelry, other jewelry including sterling silver, loose gemstones, French Sevres porcelain urns, fine crystal including Waterford and Rogaska, two Hummel full bee lamps, US coins including silver and more, Tiffany sterling mirror, other silver/plated pieces, porcelain, antiques, quality furniture. Other items may also be added. This will be an auction full of great items, not to be missed! 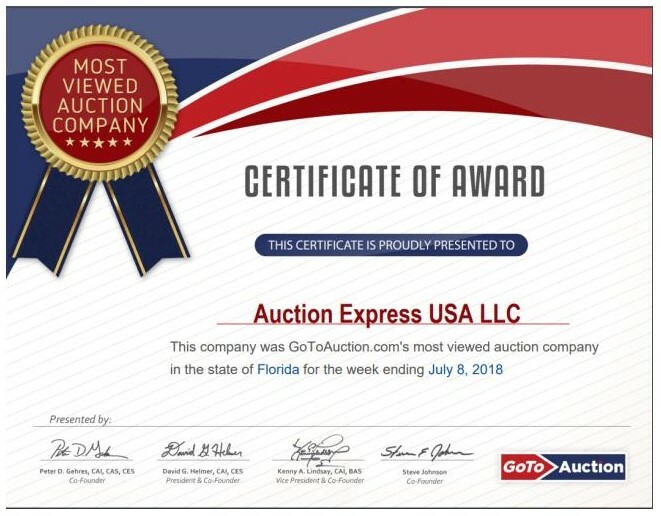 © Copyright 2019 Auction Express USA LLC. All Rights Reserved. No part of this web page may be reproduced in any way without the prior written permission of Auction Express USA LLC.